Item254 - Sketch of road between Canning & Murray Rivers by Thomas Watson [Tally No. 005040]. Item255 - Route from Pinjarra to Williams River by Lieut H.W. Bunbury [Tally No. 005041]. 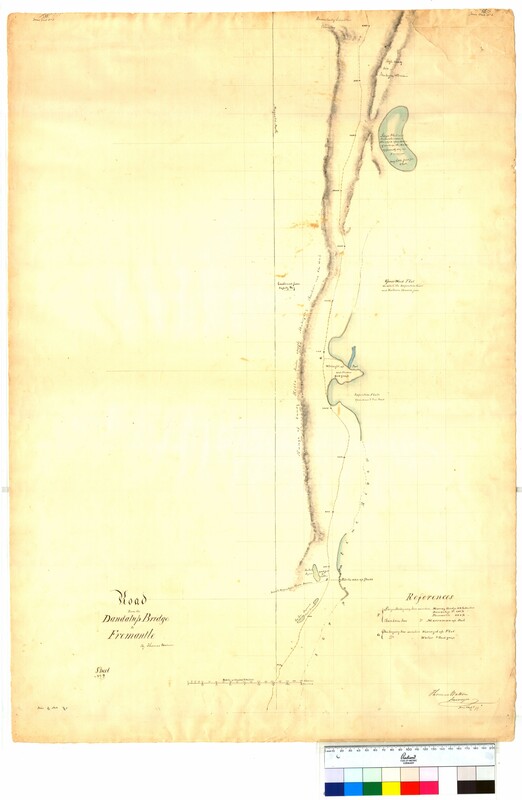 Item256 - Survey of boundary lines of the locations on the Murray River by Thomas Watson [Tally No. 005042]. Item 252 - Road from the Dandalup Bridge to Fremantle, Sheet 2. From 19 mile peg to 31 mile peg by T. Watson [Tally No. 005038]. Road from the Dandalup Bridge to Fremantle, Sheet 2. From 19 mile peg to 31 mile peg by T. Watson [Tally No. 005038]. Confirm Item Request: Road from the Dandalup Bridge to Fremantle, Sheet 2. From 19 mile peg to 31 mile peg by T. Watson [Tally No. 005038].